Martin O’Neill is set to experiment against Turkey this evening. 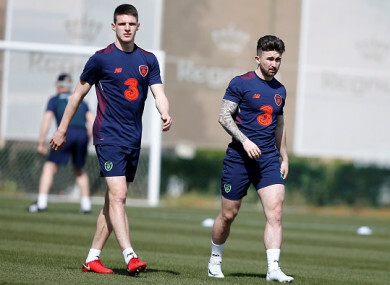 Declan Rice (left) could make his senior debut, while Sean Maguire will be hoping to add to his first cap. THE REPUBLIC OF Ireland is almost certain to have a number of newly-capped internationals by the time the final whistle goes at the New Antalya Stadium this evening. The men’s senior team take on Turkey in their opening fixture of 2018 (5.30pm kick-off Irish time), and it also represents the first game since the heartbreaking 5-1 World Cup play-off loss at the hands of Denmark last November. Martin O’Neill and his management staff may have agreed to stick around for another two-year cycle, but others have opted not to. The much-loved Wes Hoolahan retired from Ireland duty recently along with Daryl Murphy and a couple more are expected to follow suit in the coming months. A rebuilding job is needed and O’Neill has brought a 25-man squad that includes eight uncapped players — five of whom are involved in the senior set-up for the first time — on a three-day training camp ahead of today’s friendly. With several of the established names left at home, it represents a golden opportunity for youth and those on the fringes to stake a claim for regular game-time in the near future. It’s a natural challenge for some of the newer players to come in,” the Ireland boss said at yesterday’s pre-match press conference. He is likely to pick a team that contains a mix of experience and those aiming to force their way into his plans, but Matt Doherty (Wolves), Scott Hogan (Aston Villa), Declan Rice (West Ham), Enda Stevens (Sheffield United), Kieran O’Hara (Manchester United), Aaron McCarey (Ross County), Darragh Lenihan and Derrick Williams (both Blackburn Rovers) will all be hopeful of making debuts at some stage. Hammers teenager Rice has received much hype this season, which is understandable when you consider how few Irish players ply their trade in the English top flight these days. The London-born defender/midfielder picked up U19 Player of the Year at the FAI Awards last weekend and, thankfully, declared his intention to stick with Ireland rather than switch allegiance to his birth country. This would seem the perfect setting to take a look at him, while Wolves wide man Doherty has been flying in the Championship for a couple of seasons and is long overdue his chance. Fellow Dubliner Stevens, meanwhile, has a very different story. Having earned a move from Shamrock Rovers to Aston Villa in 2012, the full-back had to drop down to League Two at Portsmouth before working his way back to the second tier, where he’s now a permanent fixture with Sheffield United. At 27, the call-up is just reward for that progress. In midfield, Cork pair Alan Browne (Preston North End) and Conor Hourihane (Aston Villa) must be looking to kick on after debuts in 2017. There’s also a welcome return for Brentford’s Alan Judge, who has been hampered by a long-term injury for the best part of two years. With just three strikers on the panel, Hogan and Preston’s in-form Sean Maguire will be desperate to impress, and a first Ireland goal for either would help to do just that. It’s hard to believe Shane Long is one of the elder statesman in the group at 31, but the Southampton forward could do with a confidence-boosting display as life at St Mary’s isn’t going too well right now. The return of Seamus Coleman shouldn’t be underestimated as the Everton defender has become a major presence on and off-the-field, particularly since taking the captain’s armband. Fit again after the leg-break suffered against Wales exactly a year ago, it has been brilliant to see the Donegal native back training in Ireland gear this week. It never crossed my mind from day one that I wouldn’t be back,” Coleman said on Thursday. Like Ireland, the Turks missed out on this summer’s World Cup after finishing fourth in Group I — behind Iceland, Croatia and Ukraine. The hugely-experienced Romanian coach, Mircea Lucescu, took over from Fatih Terim last August but the former Zenit St Petersburg, Shakhtar Donetsk, Inter Milan and Galatasaray boss couldn’t turn their fortunes around in time to qualify for Russia. He will be building towards this September’s European Nations League, when they face Russia and Sweden in League B, Group 2. The result is very much secondary this evening, and both managers are no doubt more interested in seeing signs of promise from what are sure to be experimental sides. Do you agree with our Ireland starting XI to face Turkey? Email “New era begins for Ireland as youth and fringe players handed 'terrific opportunity to impress' in Antalya”. Feedback on “New era begins for Ireland as youth and fringe players handed 'terrific opportunity to impress' in Antalya”.